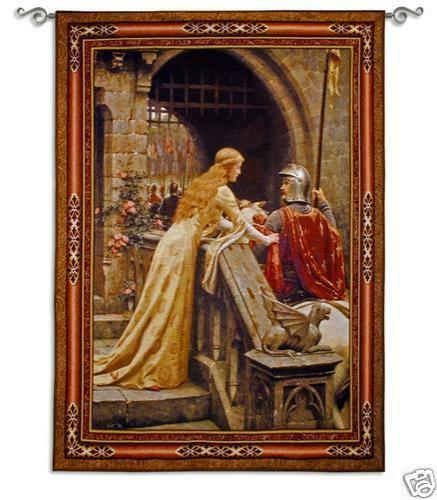 "Godspeed Medieval Tapestry Wall Hanging" A tapestry of the classic painting by Edmund Blair Leighton Entitled 'God Speed'. Featuring a beautiful red haired woman wishing her knight in armor a farewell and safe return as he prepares to ride into battle on his white steed. Woven on Jacquard looms. Cotton blend. Spot clean only. Rod pocket and weighted bottom included for easy hanging. Measures 40" wide x 53" long. Note: Rod and Tassels not included with item. Can be purchased separately in my store. Request adjusted invoice for combined shipping when purchasing a rod or tassels with this item. PLEASE NOTE: Shipping ONLY within the continental U.S. Hawaii, Alaska, and Puerto Rico residents must contact seller for shipping quote before ordering.